ETAP-Lab has strong expertise in the field of dermatology research and has developed a wide portfolio of original in vivo models, and partnered with top tier Pharma, Nutrition and Medical device companies in the field of Dermatology. 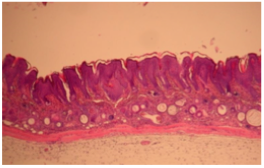 ETAP-Lab has strong expertise in Chronic Skin Inflammation and provides unique rodent model in mice. Learn more by walking through our experimental specifications, image gallery and scientific publications. You are looking for more information? Feel free to contact our inflammation experts. ETAP-Lab has strong expertise in Ischemic ulceration and provides unique rodent models in normal and diabetic mice and rats. Learn more by walking through our experimental specifications, image gallery and scientific publications. You are looking for more information? Feel free to contact our ischemic ulceration experts. 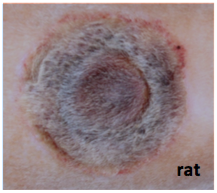 ETAP-Lab has strong expertise in Psoriasis and provides a rodent model in mice enriched with an unique behavioral scoring of scratching and licking. Learn more by walking through our experimental specifications, image gallery and scientific publications. You are looking for more information? Feel free to contact our psoriasis experts. Induction of psoriasis: topical application of Imiquimod daily for one week. Treatments: start five days after the start of induction of psoriasis. Tested products: solutions (oral or dermal route), creams, ointments, dressings, hydrogels (+ neutral covering dressing). Followed parameters: body weight, macroscopic scoring of psoriasis (several parameters), cytokine assays (IL-1β, IL-6, IL-17, IL-22, TNF-α), histopathological analysis, microscopic scoring of psoriasis. Additional parameter: behavioral evaluation (scratching and licking of the back). Reference substances possible: clobetasol, calcipotriol, compounds and dressings depending on the nature of products to test and on the treatment route. ETAP-Lab has strong expertise in Hyperkeratosis and Actinic keratosis and provides rodent models in mice. Learn more by walking through our experimental specifications, image gallery and scientific publications. You are looking for more information? 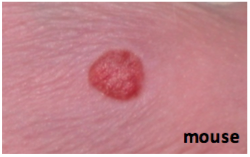 Feel free to contact our hyperkeratosis & actinic keratosis experts. 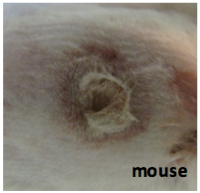 ETAP-Lab has strong expertise in Wound healing and provides unique rodent models in normal and diabetic mice. Learn more by walking through our experimental specifications, image gallery and scientific publications. You are looking for more information? Feel free to contact our wound healing experts. ETAP-Lab has recently developed and validated a preclinical model of atopic dermatis in mice allowing us to demonstrate the efficacy of products and ingredients of natural origin on this skin disorder. To complete the classic inflammatory biomarker assays (cytokines, immunoglobulins, infiltration of immune cells, histamine) and pathological methods, ETAP-Lab has developed specific scoring scales to allow a detailed analysis of the results, and the study of rodent behaviour which allows to evaluate the animals’ pain and well-being and to differentiate the activity of products tested. Contact our experts to find out about our testing and consultancy services.